has advertised for the recruitment of Teaching Faculty- PGT,TGT,Primary Teachers jobs vacancies. Interested and eligible job aspirants are requested to apply immediately. Check out further more details below. 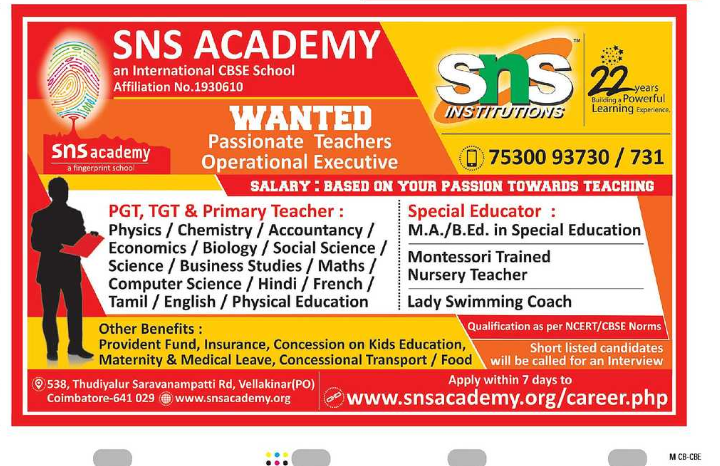 Name of the School: SNS Academy,Coimbatore Tamilnadu. 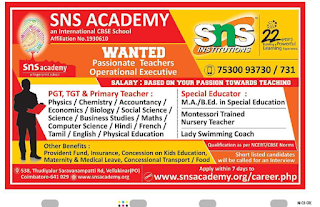 About School:SNS Academy, a Fingerprint International CBSE School - SINCE 2014 offers secular, co-educational education from Nursery to Grade XII following CBSE curriculum. Salary Package: Based on your passion towards teaching. Provident fund,insurance,concession on kids education,Maternity ,Medical leave,Concessional Transport and Food. How to Apply: Apply with in 7 days through school website career link.